Sacked former secretary to the Federal Government, Babachir Lawal has been released on bail by the EFCC. 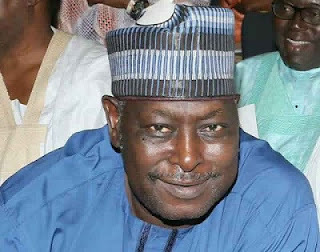 Engineer Babachir Lawal, the former secretary to the Federal Government, who is being investigated by the Economic and Financial Crimes Commission for corruption, has been released on bail. EFCC sources confirmed that he has been allowed to go home on administrative bail. He was invited for interrogation on Wednesday by the EFCC, over alleged N223million contract scams awarded at some IDP camps in Yobe State. Mr Samin Amaddin, Acting Head of Media and Publicity of EFCC, said the former SGF was cooperating with investigators and had made useful statements. Lawal arrived at the Abuja office of the EFCC at 11:00 am on Wednesday, after which he was detained. Lawal’s travails began on December 14, 2016, when the Senate Ad-hoc Committee on humanitarian crisis in the North East’ indicted him of fraud. The former SGF was accused of using his company Rholavision Engineering Ltd to corner a N230 million contract for the clearing of “evasive plant species’’ in Yobe. The contracts were awarded through the Presidential Initiative on Northeast (PINE). In total, Lawal’s crime, according to the ad-hoc committee, was that he spent N570 million to cut grass, part of which he awarded to himself. President Muhammadu Buhari later set up a panel headed by Vice President, Prof Yemi Osinbajo, to probe the allegations, along with reports that the former Director-General of the National Intelligence Agency kept some $43m in an apartment in Ikoyi Lagos. The Osinbajo report did not exculpate Babachir. President Buhari terminated his appointment and appointed Mr Boss Mustapha as the new Secretary to the Government of the Federation.